Hello and Thank You for stopping by to see our latest BEAUTIFUL AUTOMOBILE UP FOR AUCTION BY THE MOTOR MASTERS! 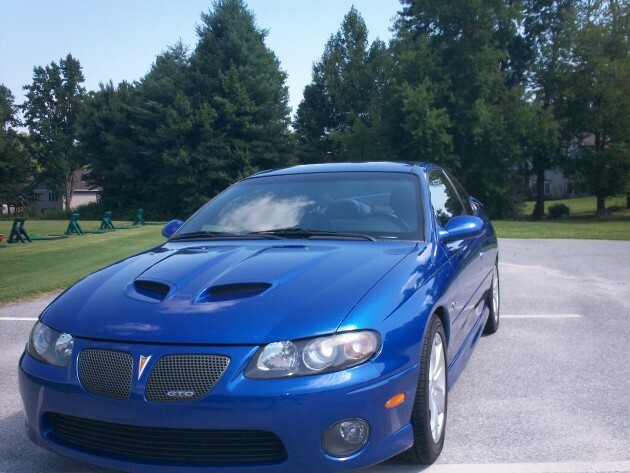 This is a 2006 Pontiac GTO with ONLY 57,380 MILES! 2006 was the LAST YEAR of the GTO so at some point in the future, this car could be a collectible. As you know, the GTOs of the 1960s and 1970s all became collectibles. HAVE YOU SEE WHAT THEY GO FOR ON BARRETT-JACKSON? This vehicle is a TWO OWNER. The exterior color is IMPULSE BLUE METALLIC and interior is blue leather. FEATURES: Has Traction Control with ABS Brakes, Cruise Control, Tilt Wheel, Full Gauges with Tachometer, Power Mirrors, Fog Lights, Vanity Mirrors, and Rear Spoiler. Stereo is Blaupunkt AM/FM with 6 CD Built In Changer that also has Steering Wheel Audio Controls.The GTO also has Dual Exhaust, Aluminum Wheels, and Remote Keyless Entry System.